I am so happy to say that I completed my THIRD 10k over the weekend and it was my best one yet! You may remember that I ran my first 10k last November with the Across the Bay 10k. It was a run over the Bay Bridge and was surprisingly fun for knocking out 6.4 miles of running! 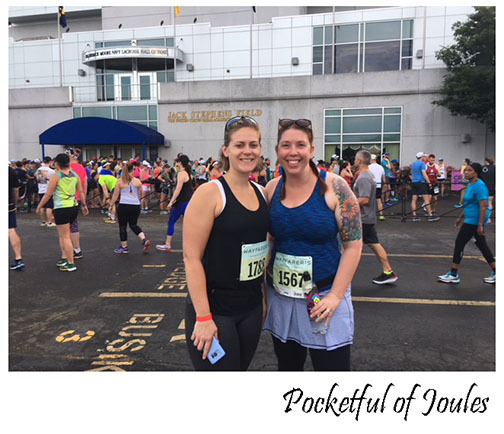 My friend Lindsey convinced me to also run the Sole of the City 10k with her in April… and that run didn’t go quite as well. Around mile 2 I felt kind of pukey with acid reflux and just overall felt like I was even slower than normal. 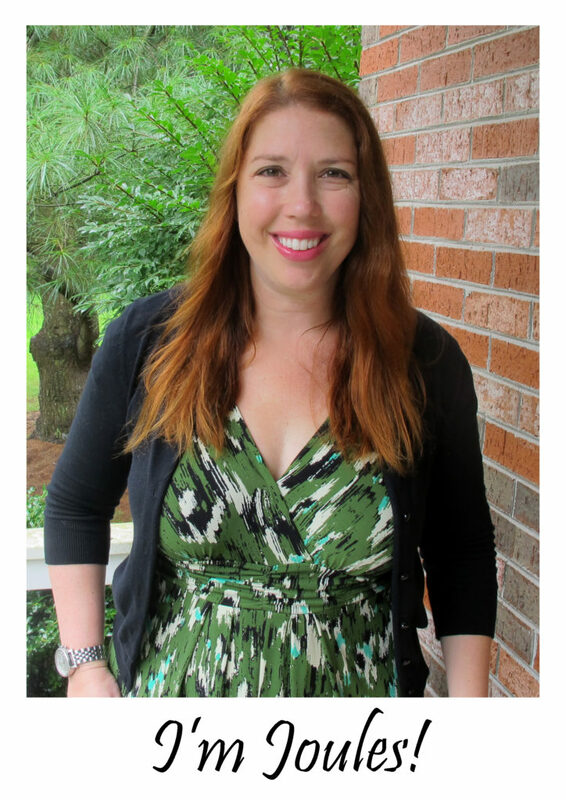 I had done basically 0% preparation though… so there was certainly room for improvement! Which brings us to my third 10k: the Wayfarer’s Annapolis 10k! This was the first year of the Wayfarer’s 10k and the run looped around downtown Annapolis. When you register for the race, they ask you to set a personal goal and then if you succeed in your goal you earn a “Goal” patch at the end! They also had super awesome premiums – rather than the typical race shirt — that I wear once and then donate because it’s never very comfortable — they gave each runner a Vooray backpack (you can see mine here) and race patch. At the finish line, instead of a medal they gave out a special finisher keepsake of an engraved carabineer. They had intended to also have a Wayfarer’s half marathon, but the day before the race they had to cancel it due to forecasts of thunderstorms. So, all the half marathon runners were invited to participate in the 10k instead. As with the Across the Bay 10k, I spent the night at Lindsey’s house so that I wouldn’t have to wake up even earlier on the morning of the race. We ‘prepared’ by having an amazingly delicious dinner, glasses of wine, chocolaty dessert… and about 5 hours of sleep. 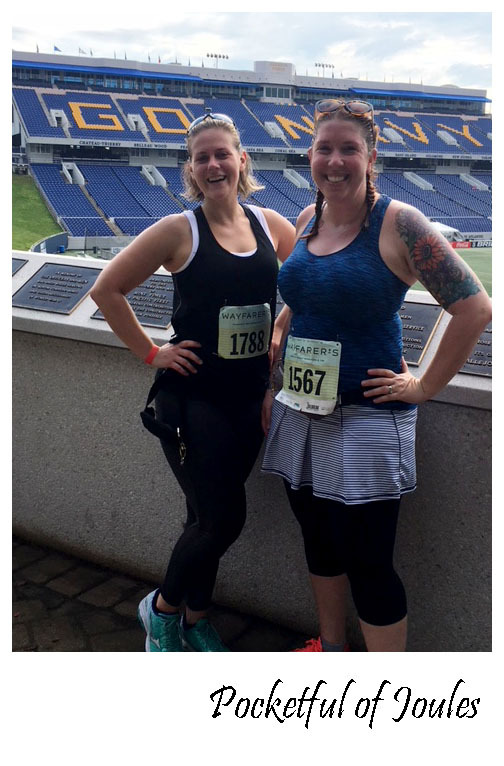 The race began at 7am, so we were up at 5:30, got dressed and ate our protein bars, and drove over to the Navy Marine-Corps Memorial Stadium. We look totally awake and ready to run, right?! While it didn’t end up raining during our run, it was SOOOO HUMID! I have never been so sweaty in my entire life… my entire race outfit was wet and I could have wrung out my braids! The run was great though with some gradual hills and beautiful views. My only goal was to feel good the entire race and beat my time from the Sole of the City 10k… and I did it! I ran about 5 minutes faster than our last 10k, so I very happily earned my “Goal” patch. 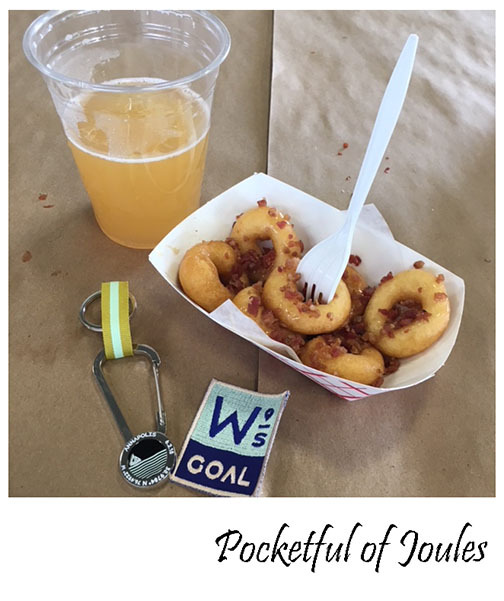 I also earned the beer and Glazy Day Donuts they gave us at the finish! After years of saying that I’d never do more than a 5k, I’m surprised at how happy I am running 10k’s. I think a lot of it has to do with the company… but I’m already looking forward to our next one!